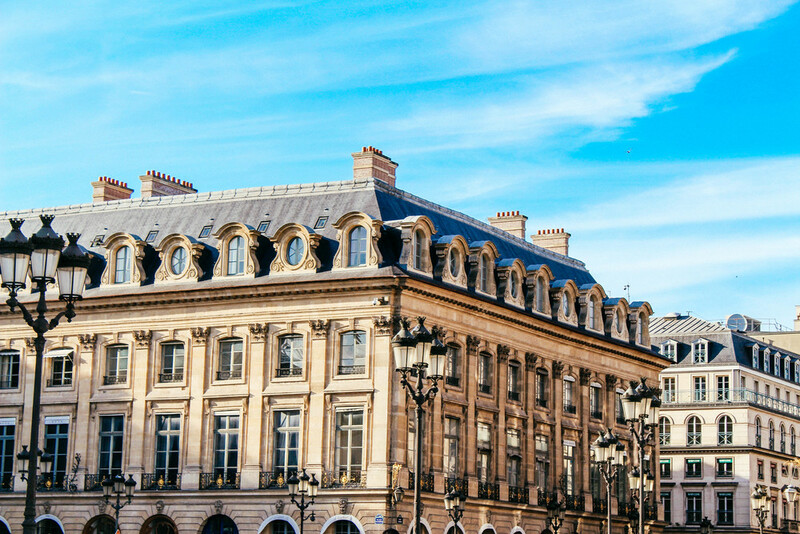 Instead of opting for the classic title of 'Postcards From Paris', I replaced it with an issue discussed in the September issue of British Vogue, namely that 'The return of Show Off Fashion' by Sarah Harris, Fashion Features Director of British Vogue. And I think this title is well-suited to these photos of my striking Noose & Monkey yellow suit. I'm a hard-shopper; not exactly in the die-hard-buy-everything type but actually I get interested in specific things and take forever to get myself to buy it. Maybe a combination of stinginess, uncertainty and just naturally particular. Mainly because of the fact that I often find myself having to pressurise myself to justify for every purchase (a.k.a investment buys as Sarah Harris puts it). Not only should there be an occasion or occasions to wear these buys, but when they come with multi-digit numbers, our wallets naturally hold us down. Though this month's Vogue tells us to buy that fun piece you've always wanted, but never bought since it was hard to justify the right reasons of purchase or healthy wear count. The latter rule made it easy to see the obsession over normcore (which can also be found on urban dictionary as dangerously regular). The fact that some in the fashion crowd are so tired of being different and irregular from each other that they give up on logos and designs. What is more interesting is that by supporting normcore, and in doing so taking away the designs and unfollowing the trends, it's almost ironically assisting suicide within the industry. The tiredness may only appear to be some outer layer excuse... because we're not all bloggers, we're not all peacocks, and just cause we like fashion does not mean we like impractical things. Though surely the most straight forward way of supporting the industry is by wearing so head-to-toe? Step 1, to all normcore fans, is not to throw out your entire wardrobe; try getting used to people talking first (step 1 for all bloggers too out there?). Then proceed. 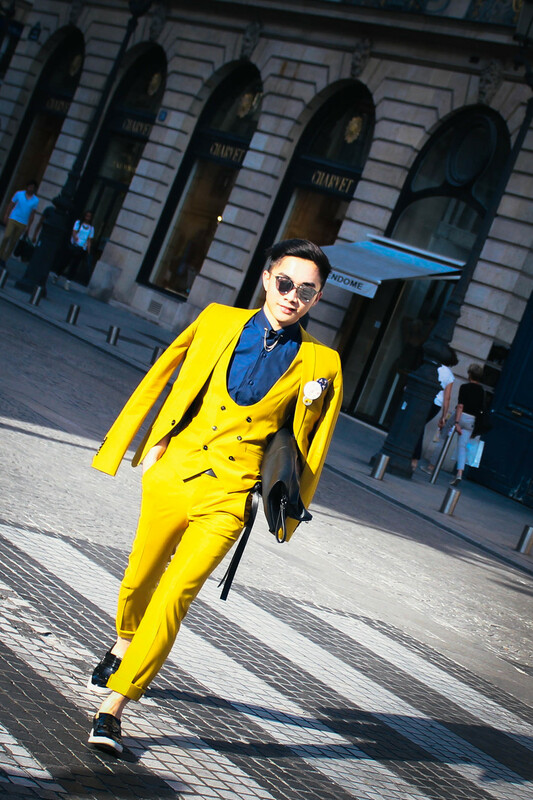 In avoidance of normcore and in favour of sartorial excellence, this yellow suit cannot be more daring yet adorned by street style photographers. 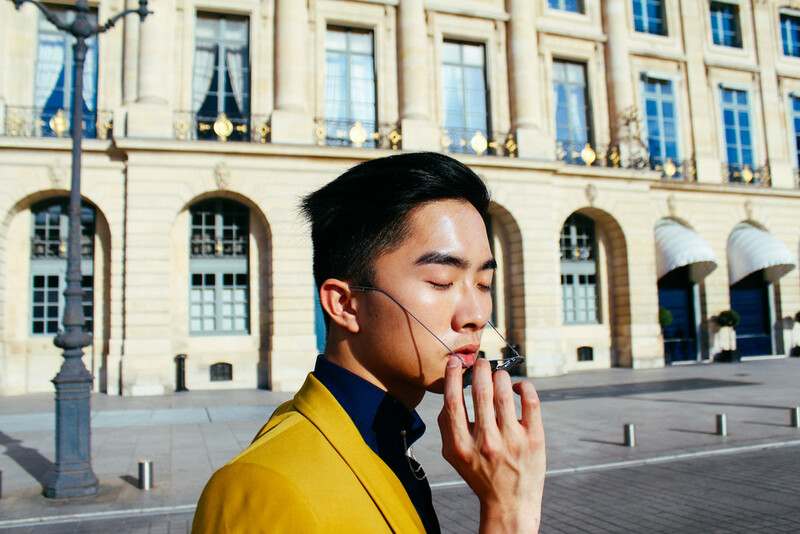 I've done two seasons of men's fashion week by now and I am still in the constant struggle of whether it is right to wear what one would 'normally wear day-to-day' and wrong to dress up like a blogger clown (a.k.a peacocking to others). Strictly, there is no fashion bible, there are no rules. I only become way over frustrated when I'm told that people with yellow skin tones cannot wear yellow - because we can. *extend arms to back, wear blazer* Though it's now 3 months since these photos were taken, I can still confidently say that 'je ne regrette rien' to be tagged as the guy in the yellow suit, for all the right reasons, I believe. 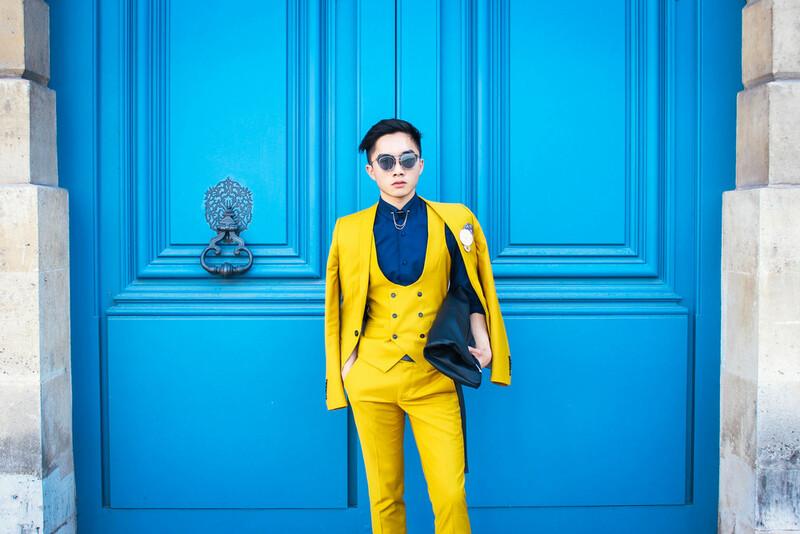 So go mustard yellow, go in a three-piece suit, go bold. Farewell minimalism, hello maximalism. 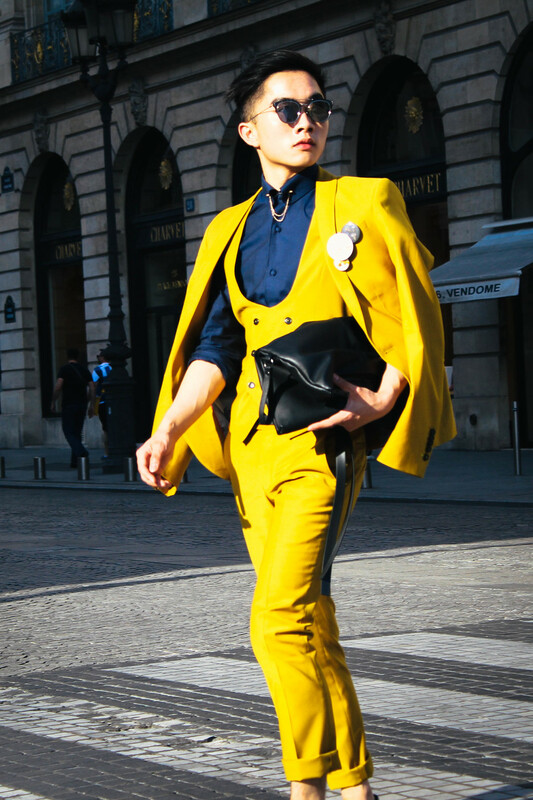 Get your yellow suit on Noose & Monkey's website or on Asos.